Security should be one of the most important considerations for your home or business. Loss of personal effects, stock, entry damage and sometimes vandalism can be prevented with the installation of a burglar alarm system. Burglars are highly deterred by burglar alarms, and as research shows, burglars said that they will avoid any premises with an intruder alarm, and choose the unprotected premises. 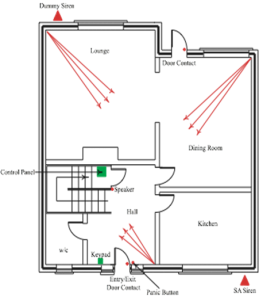 Intruder alarms sometimes referred to as burglar alarms are of two types. One is referred to as audible only and the other remote signalling. A burglar alarm system provides an excellent and effective way of both deterring the burglar from entering your property in the first place and a excellent deterrent by means of its sounders, both inside and outside alerting everyone in the vicinity to the activation. Upon activation the sounders continue for a maximum of 15 minutes to deter burglars from the premises. Audible alarms do not signal the police, but can be supplemented with a speech dialler that can dial up to four telephone numbers and advise you or others of the activation. Police attendance is only possible with a remote signalling system and conformity to the regulations appertaining to such. Secure Alarms provide a free survey to establish how best to protect your property. The surveyor will assess to the new European system standards EN50131-1 including PD6662 a system that meets with your insurers risk and needs. A typical audible alarm normally suitable for premises such as a house or small business would be graded “low to medium risk” and deemed Grade 2. Your insurance risk proportional to the value of the property and its contents. Secure Alarms are NSI Gold Medal Accredited to carry out a risk assessment of your property and meet both Insurance and Police policies. All systems come with a NSI (NACOSS) certificate upon completion.